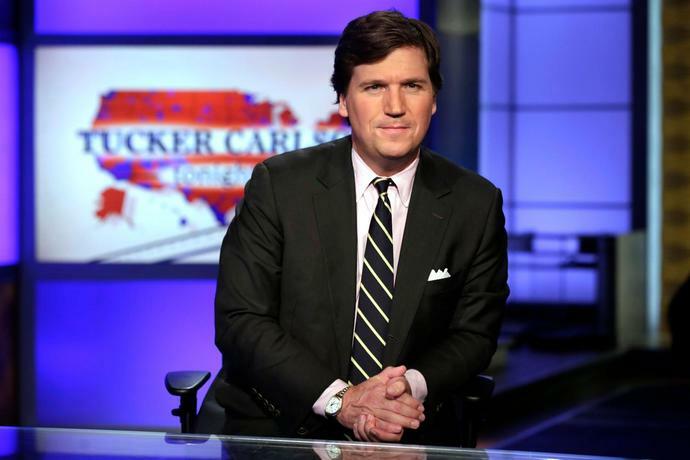 WASHINGTON - Fox News host Tucker Carlson used a portion of his show on Wednesday to address a now-viral video showing him cursing at a guest and calling him a moron during a segment that never aired. While admitting the profanity-laced comments were "rude," Carlson said they were "accurate" and added: "It was genuinely heartfelt. I meant it with total sincerity." The video was published by NowThis News Wednesday afternoon and within eight hours had been viewed more than 3.5 million times on Twitter. It appears to have been secretly recorded by Dutch historian Rutger Bregman or someone who was present for his interview with Carlson earlier this month. Bregman was invited on the network after he appeared on a panel during the worldwide economic conference in Davos and said to the crowd of elites that the rich should pay more in taxes. After talking about tax policy, Carlson and Bregman's conversation took a sharp turn and things got heated. Bregman argued that most people believe that the rich should be taxed more and the only reason that issue wasn't highlighted more on Fox News was because the network, and its anchors, were "bought by the billionaire class." Bregman accused Carlson of taking "their dirty money" and called him a "millionaire funded by billionaires." He said Fox News and Carlson's show was "part of the problem." Carlson replied with profanities. "Why don't you go f--- yourself, you tiny brain," Carlson said. "I hope this gets picked up because you're a moron. I tried to give you a hearing, but you were too f---ing annoying." During Carlson show on Wednesday, he said admitted the profanity-laced replies to Bregman weren't in good taste. "I did what I try hard never to do on this show and I was rude," Carlson said. "I called him a moron and then I modified that word with a vulgar Anglo-Saxon term that is also intelligible in Dutch." He continued: "In my defense, I would say that that was entirely accurate but you're not allowed to use that word on television," adding that was why the segment did not air. "It was genuinely heartfelt," Carlson said. "I meant it with total sincerity." He said he lashed, in part, because the accusations that his show and Fox News were guided blindly by billionaires. "Whatever my faults or those of this channel, nobody in management has ever told us what positions to take on the air," Carlson said. "Never. Not one time. We have total freedom here and we're grateful for that."